Universal Pictures offers replacement Gladiator Blu-ray discs | What Hi-Fi? The Hollywood Studio came in for hefty criticism when the disc was released last September, with home cinema enthusiasts complaining that the film suffered from an excessive amount of digital noise reduction, spoiling the high-definition transfer. A brand-new encoding has gone on sale in the Netherlands, and is expected to replace the current disc in UK stores soon. 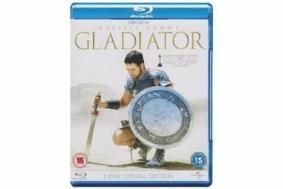 'Universal Pictures UK has been pleased with the success of Gladiator on Blu-ray, which has resulted in a high level of customer satisfaction. "However, whilst there was no technical fault on the original Blu-ray master, a small number of enthusiasts have expressed a preference towards slight technical alterations. After careful consideration, we have revisited the mastering process to address those concerns. 'If you wish to exchange your original UK purchased DVNR (digital video noise reduction) feature disc we ask that you send us just your Disc One in an envelope with your name and address enclosed. Please keep your original packaging and we will post you out a new Disc One.